Installing SugarCRM on Rackspace Cloud Sites has been described in this step by step guide so that anyone can easily follow the guide and install easily. We wrote about the basics on CRM or Customer Relationship Management itself and the softwares in one article. SugarCRM is a PHP MySQL based software and required MySQLi database. Actually the installation process is easy. You have to decide whether you will install on Subdomain or sub folder. Decide this part first before you are installing SugarCRM on Rackspace Cloud Sites as moving the site with data, unlike WordPress is not that easy. Drag all the contents inside the uncompressed folder of SugarCRM. Look at the diagram. You should copy all at the level where the robots.txt file is included. It will take a bit time, but we have other works now. 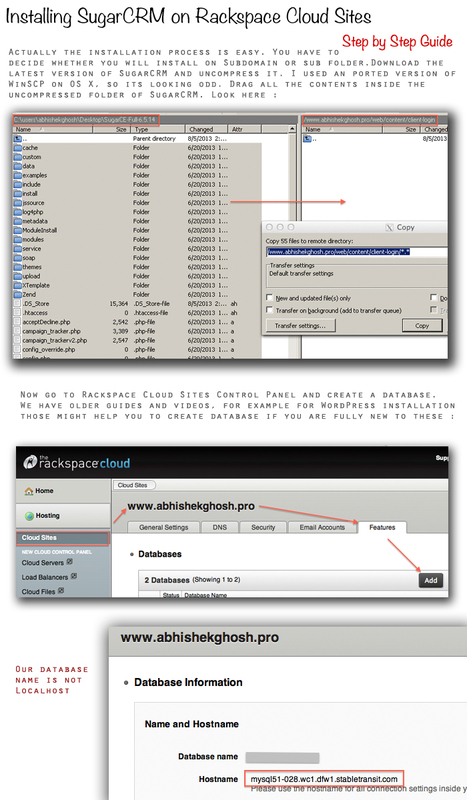 Now go to Rackspace Cloud Sites Control Panel and create a database. If you are not sure what you are doing, please read and watch the Video Guide for Installing WordPress on Rackspace Cloud Sites. The basic things are same for both WordPress and these any kind of PHP MySQL based software. WordPress is cleaner to install, others usually gives some pain, depending upon which software it is. More less used, more will be the pain. Click Next to start install process. Check the Agreement box to agree with the license and click Next. Choose install type (for this tutorial, we will be doing typical install). Click Next.Choose Database and click Next. Enter database information from step 3 (database_name/user, password, add our localhost name etc). Click Next. Next steps are easy. After login, you might get error including the line “Please contact support”, disable the strainer module for technical support. This Article Has Been Shared 2699 Times! WordPress Cloud Backup Plugin is an under development plugin, by feature it will be most advanced to backup in any advanced WordPress Installation on any Cloud. Cite this article as: Abhishek Ghosh, "Installing SugarCRM on Rackspace Cloud Sites," in The Customize Windows, August 5, 2013, April 23, 2019, https://thecustomizewindows.com/2013/08/installing-sugarcrm-on-rackspace-cloud-sites/.